On 25 September 2015, the United Nations approved the Global Agenda for Sustainable Development and its 17 Sustainable Development Goals (SDGs), articulated in 169 Targets to be reached by 2030. It is an historical event, because a clear judgment has been expressed on the unsustainability of the current development model, not only on the environmental level, but also on the economic and social one. In this way, and this is the highly innovative character of the Agenda, the idea that sustainability is only an environmental issue and an integrated view of the different dimensions of development is definitively overcome. Below are the main focuses of the 17 Sustainable Development Goals; each SDG is then characterized by a series of specific Targets that represent the different areas of action that, for each area, define in a concrete way the tools with which to reach the Goals of the Agenda. For complete information on the SDGs and their targets, click here. The challenge for complex, polycentric and multi-stakeholder organizations, such as universities, is to seize the opportunities of the Agenda 2030 to promote new institutional governance mechanisms, coherently orienting internal decision-making processes, allocating resources, redesigning organization, the system of incentives for teaching and research. 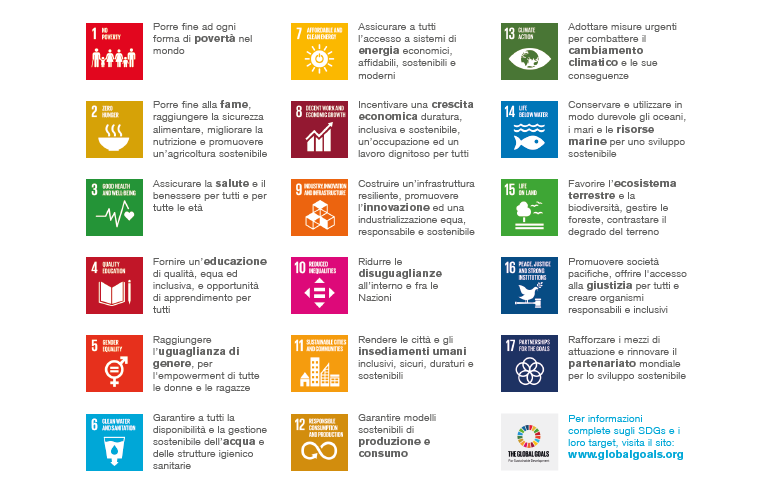 Born with the aim of promoting the SDGs, spreading culture and good practices of sustainability and strengthening the value of the Italian experience at an international level, the Rete delle Univesità per lo Sviluppo sostenibile (RUS) has seen the Polytechnic of Turin among its promoters since July 2015. The RUS represents the first experience of coordination and sharing among all Italian universities involved in the issues of environmental sustainability and social responsibility. In this perspective, also for the Polytechnic of Turin, also a partner of ASviS, Alleanza Italiana per lo Sviluppo Sostenibile, the United Nations 2030 Agenda represented an innovative guideline for an integrated approach to strategic planning and social reporting in which to give expression to the effects of government action in terms of economic growth, social inclusion and environmental protection.